Can you imagine a toaster hacking a computer? That’s true. 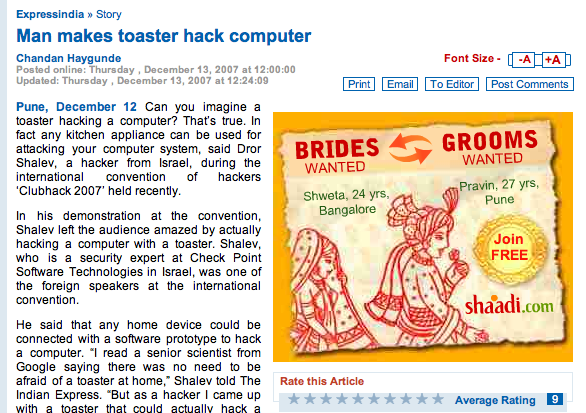 In fact any kitchen appliance can be used for attacking your computer system, said Dror Shalev, a hacker from Israel, during the international convention of hackers ‘Clubhack 2007’ held recently. In his demonstration at the convention, Shalev left the audience amazed by actually hacking a computer with a toaster. Shalev, who is a security expert at Check Point Software Technologies in Israel, was one of the foreign speakers at the international convention.